Grand Prix is busting out all over! The fifth and sixth steps of the 2010 NADF Grand Prix will take place this weekend in Columbus, Ohio, and Cambridge, Mass. If you're playing in either event, good luck! Meanwhile, here are the Grand Prix' top 10 players through the first four events (Temple, CODCon, Whipping and Dixie). Each player may score up to four events. For the winner, an event is worth 10 points per board in the three largest rounds. Each subsequent place scores 90 percent of the previous place, down to a minimum of 5 points just for showing up, 10 if it's a DipCon. Holy crap, this man is now a father. Please join me in welcoming future Weasel Elliot Duenow to the world. He checked in at 9:21 this morning at a whopping 23 inches. Greg, Stacy and Elliot are all doing great. Carnage won the 2011 DipCon vote in a landslide, capturing 77.4 percent of the vote (24 of 31 votes). Four people, or 12.9 percent, voted to start the process over and gather new bids. Present managed only three votes, a disappointing 9.7 percent. Congrats to Carnage (http://dipcon2011.nedip.org/). Hope to see you there in 2011. Seven Weasels took part in the process, an impressive 22.6 percent of the voting body. 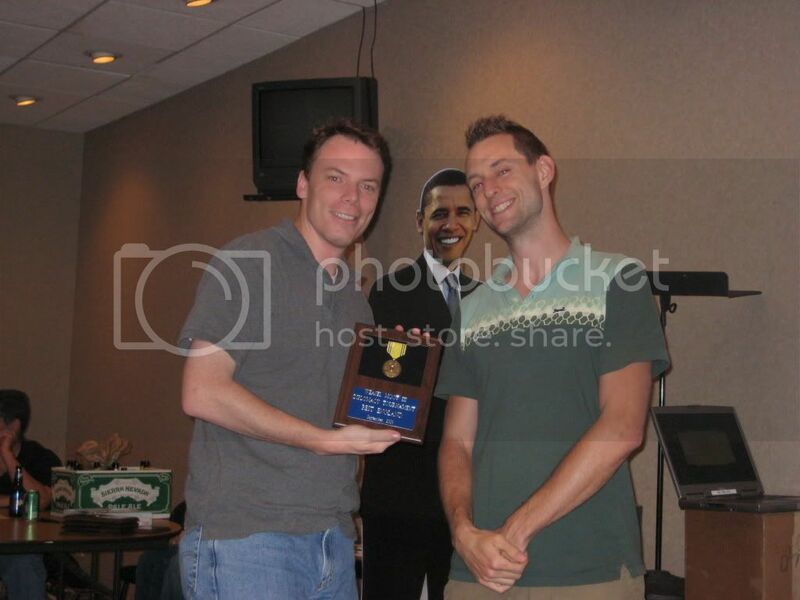 Former World Champ Doug Moore (left) accepts the Best England award from Tournament Director Jeremiah Peterson at Weasel Moot III, as President Obama looks on. President Obama, the Blackhawks and the Windy City Weasels cordially invite you to the cozy southwestern suburb of Burr Ridge for the fourth installment of the Diplomacy hobby's best-named tournament, Weasel Moot IV, to be held Sept. 24 to 26 at the Quality Inn. Preregistration is now open. All the details you need are right here. What: Weasel Moot IV, the Windy City Weasels' premier Diplomacy tournament. The three-round tournament is the ninth step of the 2010 Grand Prix and the third step of the Central Shuffle. Where: The Quality Inn in Burr Ridge, 300 S. Frontage Road, Burr Ridge, IL 60527. Round 1--Hat Night! 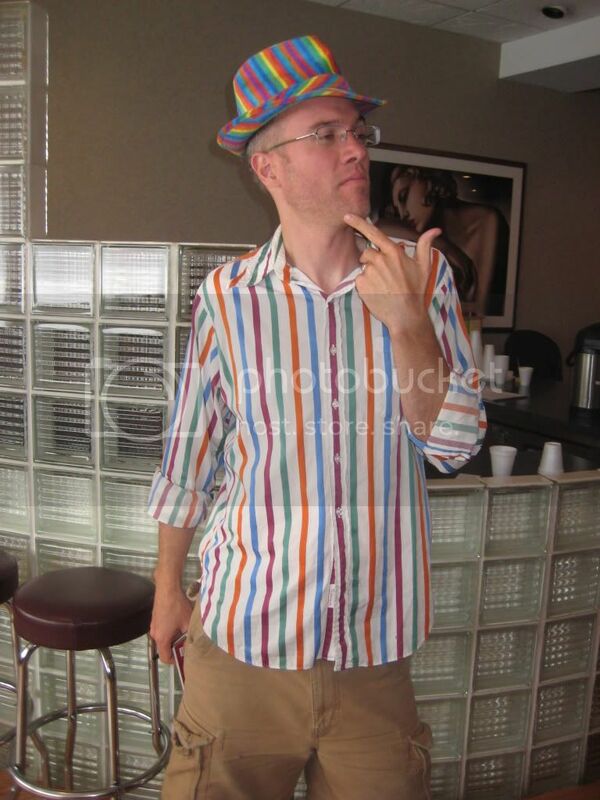 Wear your finest and/or funniest hat. Best lid wins an award! Registration: 6:15 to 6:45 p.m. Round 2--Team Round! Recruit two friends, craft a clever name, and compete for top team honors. Best team name also wins a prize! Registration: 9:00 to 9:30 a.m. Round 3--Movie Night! Come for the Diplomacy, stay for the finest films in Tournament Director Jim O'Kelley's collection! Registration: 6:45 to 7:15 p.m. Lodging: Here's the best part: A room at the Quality Inn is only $79 per night, and that includes breakfast! To reserve your room, please call 630-325-2900 and mention that you are with Weasel Moot. Check out this flier for more on the hotel! Awards: Yep, we'll have them, and it only takes one round to qualify. You'll compete for first- through seventh-place plaques, plus the coolest Best Country awards on the circuit. Plus, we'll have awards for the best team in the Team Round, and other fun prizes. Scoring: We'll be using our tried-and-true Modified Whipping scoring system. Your best two of three rounds will count for score. For details, tournament rules and the like, click here. Check out these tips for attendees. And here's the current list of attendees. Mark Your Calendars! Weasel Moot IV Is Sept. 24-26! The Windy City Weasels cordially invite you to Chicago -- home of the Stanley Cup Champion Blackhawks, our beleaugured president, and the hobby's best-named Diplomacy tournament -- for Weasel Moot IV, to be held Sept. 24 to 26 at the Quality Inn in southwest suburban Burr Ridge. The three-round tournament will begin Friday night at 7 p.m., with two rounds on Saturday, and an awards ceremony at 10 a.m. Sunday. The hotel is conveniently located near both Midway (15 minutes) and O'Hare (20 minutes) airports, and the room rate is just $79 per night, which includes breakfast. More details will be on our website (windycityweasels.org/wm4) and in your mailboxes shortly. For now, just mark your calendars and check out what some of last year's attendees had to say. Melinda Holley (Postal Hobby legend): Thanks for making this past weekend so much fun. I was totally shocked to make the top board, so that was just icing on a very nice cake. Needless to say, I'm looking forward to Weasel Moot IV. Pete McNamara (The Chicago version, as opposed to Australian Peter McNamara, who currently resides and plays Dip in New England): Weasel Moot was a blast. What a great tournament! Vince Lutterbie (Former postal hobby zine publisher): Thanks to all for a fabulous time! Peter Yeargin (Then a bright-eyed Diplomacy newcomer): I had a lot of fun. Gary Behnen (1991 DipCon Champion): Had a great time getting pounded! Edi Birsan (Diplomacy's Yoda): Had a great time. I will be urging everyone to go to your event. Jonathan Hill (Diplomacy's Goodwill Ambassador): We got some single-minded, stubborn mother f$#!ers in Chicago. I'm posting this at the request of Chris Martin, the 1998 world champion and our first Alpha Weasel. Chris Martin here, with some exciting news for the North American Diplomacy hobby! Over MLK weekend some of the best diplomats in North America will meet in Austin, Texas, to compete in an invitation-only Diplomacy event. To date, 67 diplomats have qualified for the 2011 Masters by finishing in the top seven results at an NADF Grand-Prix event in 2009 or 2010. Currently, I am working with Brian Shelden, Conrad Woodring, and Jeremiah Peterson to make this a premier Diplomacy event. Part of organizing a great event is assembling fabulous talent to get the behind-the-scenes details right,and with this crew, I feel certain that the 2011 Master's Tournament will be an event to remember. You may ask why I have am hosting an event that is not open to the general public -- a fair question. Over the years that I have been in the hobby, I have often heard (and occasionally voiced) a desire for an event that guaranteed that every participant understood, at the very minimum, the mechanics of the game, and ideally really knew what they were doing on the board. This discussion usually peaks around the times of Dip-con/World Dip-con, and during a recent online discussion of the relative merits of the title, I announced my intention to host an event where everyone involved would know, going in, that the competition would be among those who had proven themselves able to play the game. The North American Diplomacy Federation Master's Tournament is the result. There is still time left to qualify! 7 people each will qualify at Massacre, Husky, Conquest, WeaselMoot, Buckeye Game Fest and Tempest -- will you be one of them? I hope you will! May was a great month for the Weasels. We played three house games and capped it off with outstanding tournament performances on both coasts by Peter Yeargin (second place at Dixie) and Adam Berey (first place at KublaCon). June also promises to be an active month. We'll start things off with our 100th game celebration at Guthrie's Tavern on June 10. We're hoping for three boards. Check out the Current Games Signup List or the Meetup event and sign up. On June 12, Sam Bassett will host another house game. That one is full, but we can always use standbys. The rest of the month will be quiet for the Weasels, but there are two Grand Prix-eligible tournaments the weekend of June 26. I've heard Greg Duenow, Don Glass and Sam Bassett all mention the possibility of attending Origins, which will be June 24 to 26 in Columbus, Ohio. The Boston Massacre will be June 26 to 27. Who wants to represent the Weasels? New England sent three players to Weasel Moot. Yeargin Surges to Third Place in the Grand Prix! Now that I've put that song in your head, here's a quick Grand Prix update. On the strength of his DixieCon performance, Peter Yeargin has surged into third place in the Grand Prix, within striking distance of Adam Sigal. Steve Cooley is in second, but neither one of them is planning to attend HuskyCon in July, which likely will be the circuit's largest event this year. Here's a look at the top 25 through DixieCon, the circuit's fourth leg. The list contains several Weasels. A total of 89 players have participated so far. If you attended any two (2) of these events, then your vote for DipCon 2011 counts. Please note in your vote which events you have attended. DipCon Committee notes on Carnage: Carnage is a long-running and stable tournament site, with a good history and no issues with rule-sets or tournament structure. It is also part of a larger gaming tournament. The only area of concern to the Committee is that the event site is a hotel that commonly sells out well in advance of the event, and alternate hotels can be a significant distance away. To address this concern, the Carnage Diplomacy staff assures us that there are generally enough cancellations to allow late booking, and that they have a number of other strategies for guaranteeing space for travelers, including extra reserved rooms and/or a rental house within walking distance of the site. What do the four most recent Grand Prix champions -- Adam Sigal, Thomas Haver, Doug Moore and Jim O'Kelley -- have in common? No, it's not their roguish good looks, their lush heads of hair, or even that they like to talk about themselves in the third person. Those four also happen to be the four most recent DixieCon champions. This weekend, DixieCon will once again be a key Grand Prix battleground as hopefuls from the East Coast and the Midwest descend on Chapel Hill for the fourth leg of the circuit. Steve Cooley (third place, 153.84 points) of New England is the only one of the current top five expected to play at Dixie, but Chicago's Peter Yeargin (ninth place, 77.56 points) and North Carolina's Tom Kobrin (10th place, 76.53 points) will also be there. Former Grand Prix champions O'Kelley, Moore, Chris Martin and Andy "Buffalo" Bartalone have also signed on, as have perennial contenders Dave Maletsky and Graham Woodring. Throw in Rick Desper, one of four former North American champions expected to play (along with Kobrin, Martin and Moore), and it should be a hard-fought tournament. The players are again chasing New York's Adam Sigal, who leads the Grand Prix with 199.6 points. DipCon champion Eric Mead of Seattle is second with 160 points; Chris Brand of Vancouver, fourth at 144; and Don Williams of California, fifth at 104.98. Four weeks after Dixie, the competition will pick up again with Origins in Columbus, Ohio, (June 24 to 26) and the Boston Massacre in Cambridge, Massachusetts (June 26 to 27). Then it's on to HuskyCon in Long Island, July 8 to 10. Husky long has been one of the hobby's favorite tournaments, but in recent years, it also has become one of the circuit's largest Grand Prix purses. But no tournament has been more significant than Dixie. Hope to see you there. Grand Prix action heats up again next week at the venerable DixieCon in Chapel Hill, N.C. Peter Yeargin and I will be traveling there to represent the Weasels. DixieCon has played host to four DipCons and two World DipCons. In recent years, it has been a major battleground in the Grand Prix. In each of the past four years, the DixieCon champion has won the Grand Prix. Of course, the Grand Prix is only part of the draw for Peter and me. We're also going to renew acquaintances with the friends we've made on the circuit, to sample the Saturday night barbecue, and to hit several of Chapel Hill's finest drinking establishments. If you're interested in Diplomacy travel, there are a couple of good options in June, both near and far. Origins, host of last year's World DipCon, will be held (I think) June 24 to 26 in Columbus, Ohio. It's the second leg of this year's Central Shuffle. Sam Bassett and Don Glass both have expressed interest in attending. The Boston Massacre will be held June 26 to 27 at a game store in Cambridge. Post in the Comments section if you'd like more information. The New Englanders sent three representatives to last year's Weasel Moot. It would be nice to reciprocate by supporting the Massacre or Carnage (in November). Save the Dates -- Pyle and Royale and Moot, Oh My! The Windy City Weasels are pleased to announce the dates for three of our cherished institutions. Which will be held Sept. 11 at Dan Burgess' home in Downers Grove. The top seven dues-paying members of Season Five will be invited to compete for the 2010 club championship. Finally, Weasel Moot IV will be held September 24-26 at the Quality Inn in Burr Ridge. Details coming soon. Join us in welcoming future Weasel Beckett MacDonald to the world. He was born yesterday morning, checking in at 8 lbs., 11 ozs. Christian, Josee and Beckett are doing great. We're having some technical difficulties updating the World Diplomacy Database, so while we work on that, here's a look at the season 5 standings through today's game. Yeargin jumped from fifth to second today, while O'Kelley remained in third but leap-frogged Alpha Weasel Matt Sundstrom. O'Kelley also wrested Best France honors from Sundstrom, while Yeargin took Best Italy from Christian MacDonald.